Help the American Red Cross Sound the Alarm about home fire safety. This spring we’re rallying 30,000 volunteers to team up with fire departments and partners to install 100,000 FREE smoke alarms nationwide, in at-risk communities. We will be installing FREE smoke alarms in Brownsville on Saturday, April 27. To request the installation of smoke alarms in your home on April 27, please contact the Brownsville-Haywood County Fire Department at 731-772-1396. 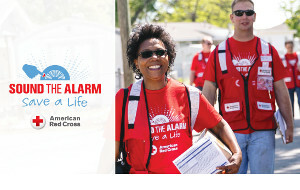 Volunteer for Sound the Alarm on Saturday, April 27 from 9:00 a.m to 2:00 p.m. in Brownsville, Tennessee. Rally point: 19 W. Franklin Street, Brownsville. Every day, 7 people die from home fires. Since 2014, we’ve saved more than 500 lives and made more than 600,000 households safer. Join our growing movement. Visit SoundTheAlarm.org/Tennessee or call David Hicks at 901-208-0152.